Points Needed: 26450 Software is not compatible with mobile and tablet devices. Please add this title to your Wish List and sign on to your the first club account from a desktop computer to complete your redemption. ABOUT THE SOFTWARE The perfect video studio. 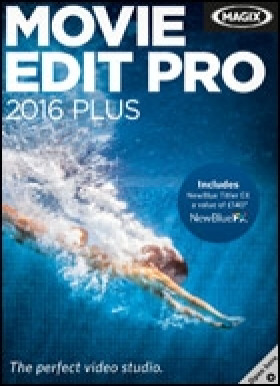 Get truly amazing video editing results with MAGIX Movie Edit Pro 2016 Plus. A unique range of powerful, flexible tools, an intuitive interface and cinema­quality effects let you bring your video projects to life exactly the way you want. Discover new features such as automatic video editing, 25 editable templates and special effects designed for… action cam footage. The first video editing program with 360° editing, Movie Edit Pro 2016 Plus opens up new creative perspectives. With this feature, you can now showcase material from panoramic cameras like Giroptic, Kodak or Ricoh the way you want. Immerse yourself in the virtual world via panorama views of interiors, the wilderness or crowds of people.KEY FEATURES Comprehensive action cam support 360° editing for panoramic camera recordings Configurable effect transitions Beat­based video editing Modern title templates Improved object tracking Decoding: HEVC import*, H.264 hardware acceleration Perfect image stabilization with proDAD Mercalli V2 NewBlue Titler EX for creating dynamic titles & captions 4K proxy editing for smooth video editing Simultaneous multicam editing on up to 4 cameras Movie Edit Touch for Windows & Android tabletsSYSTEM REQUIREMENTS	Minimum system requirements: For Microsoft Windows 7 / 8 / 10	64­bit systemsAll MAGIX programs are developed with user­friendliness in mind so that all the basic features run smoothly and can be fully controlled, even on low­performance computers. The technical data for your computer can be found in the control panel of your operating system. Processor: 2 GHz and higher RAM: 2 GB Hard drive space: 2 GB for program installation Graphics card: 1280 x 768 resolution	Internet connection: Required for activating and validating the program, as well as for some program features. Program requires registration. Recommended configuration for 4K/HD editing: To get the most from these features, your system should at least meet the recommended requirements. The technical data for your computer can be found in the control panel of your operating system. Processor: Quad core processor with 2.8 GHz or better RAM: 8 GB Graphics card: Dedicated, min. 512 MB VRAM	Supported import formats Video: (DV­)AVI, HEVC/H.265*, MPEG­1/2/4, M(2)TS, MXV, MJPEG, MOV, WMV(HD), MKV, VOB Audio: WAV, MP3, OGG, WMA, MIDI, Surround­Sound/5.1 (Downmix to stereo) Image: JPEG, BMP, GIF, TIF, TGA	Supported export formats Disc: DVD, Blu­ray Disc, AVCHD disc Video: (DV­)AVI, HEVC/H.265*, MJPEG, MXV, MPEG­1/2/4, MOV, WMV(HD) Audio: WAV, MP3 Image: JPEG, BMP Supported Devices FireWire Interface: for using DV/HDV camcorders USB Interface: for using HD camcorders, cameras, hard drive recorders and webcams Video­, TV or Graphic Cards with Video Input: for digitizing analog sources Optical Drives: Blu­ray, DVD­R/RW, DVD+R/RW­, DVD­RAM or CD­R/RW burnersNote: MP3 export requires the installation of Windows Media Player version 10 or higher. *HEVC­Encoding requires a fee­based initial activation. Copyright © MAGIX Software GmbH, 2001­2015. MAGIX is a registered trademark of MAGIX GmbH & Co KGaA. Other mentioned product names may be registered trademarks of the respective manufacturer. MAGIX licensing conditions are made clear in the installation process and can also be found at www.magix.com under EULA. This product uses MAGIX patent technology. The represented texts, graphics and photos are only intended to provide information on MAGIX products and contain copyright­protected material. Reproduction and distribution of this material is therefore not permitted and shall require the express permission of MAGIX.